Elizabeth Sheehan, C2C President & Co-Founder, attended the 2018 Skoll World Forum on Social Entrepreneurship in Oxford, England. The highly-anticipated week-long event brought together social entrepreneurs from around the world to discuss and tackle the world’s most pressing problems such as the role of technology in improving health outcomes and lifting people out of poverty. A key takeaway came from one session in particular, “Emerging Technologies: Shifting the Path from Poverty to Prosperity”. The discussion debated how the impact of rapid technological change on developing countries can benefit the poorest populations. Our friends at LivingGoods, who were part of this session, is looking at how technological innovations can improve health outcomes. They also explained that “there are many hurdles to overcome in using mobile technology to provide health advice and support. It is essential that services are designed to take these factors into account and find ways around these obstacles“. Other expert panelists agreed that emerging technology and its impact were just too simplified and should address the communities they are meant to serve. 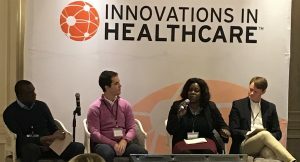 Allison Howard-Berry, C2C Executive Director & Co-Founder, attended the 2018 Innovations in Healthcare (IiH) Annual Forum in Washington, DC. This two-day annual gathering brings together innovators and leaders in the social, private, and public sector to collaborate and exchange ideas and insights to support the scale and impact of promising healthcare innovations. IiH introduced their new 2018 cohort who focus on care delivery, as they shared their strategies to ensure that the diverse populations they work with have access to affordable, high-quality healthcare. Congratulations to Biofourmis, Living Goods, OneWorld Health, and Reina Madre! 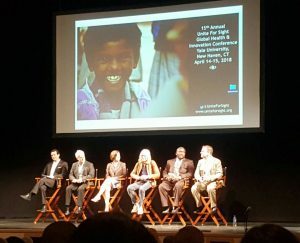 Unite for Sight’s 2018 Global Health & Innovation Conference is the leading global health conference held at Yale University in New Haven, CT. This thought-leading conference convenes leaders, changemakers, and participants from all sectors of global health, international development, and social entrepreneurship.Catherine Guillou-Ouellette, C2C Program Manager in Haiti, flew in to participate and hear from various panels such as one by Jeffrey Sachs, Economist and Director of the Center for Sustainable Development at Columbia University, titled “How Health For All Is Within Our Grasp”. He gave a powerful presentation about prioritizing the strengthening of national public health systems in poor countries. We are happy to hear that Mr. Sacks is making a compelling case for what C2C is doing on the ground in Haiti through our strategic Public-Private Partnership with Haiti’s Health Ministry. As C2C’s newest clinic gears up for the grand opening, we are grateful for the opportunity to keep learning and applying successful and effective strategies to continue expanding access to health services for vulnerable communities in Haiti! This entry was posted on May 3, 2018 by Joyce Bassil Zerka.